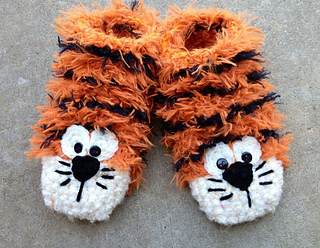 INFO: My son needed furry tiger feet for an opera costume so he helped me design these. SKILL LEVEL: Basic crochet skills needed. Fur is a little tricky to work with, but patterns calls for worsted weight yarn to be held with fur, making it easier to see stitches. Don’t fear the fur! It is totally worth it. MATERIALS: Fur yarn (sample was made with Furrish, but Fun Fur will work also). Non fur yarns of equal weight may be substituted, but may affect size and appearance. INSTRUCTIONS INCLUDED IN PATTERN: Make a pair of slip on furry feet.